The process to appoint a new PSNI chief constable has been compromised by comments made by the Sinn Féin leader, Arlene Foster has said. On Monday, Mary Lou McDonald indicated an outsider should replace the current Chief Constable George Hamilton. The Equality Commission has expressed concern about the comments. DUP leader Mrs Foster said the comments were foolish and that her party had told the Policing Board it wants legal opinion taken. "I thought they were very foolish, first of all because essentially what has happened is that the process has now been compromised," Mrs Foster said. "The leader of one of the political parties involved in the panel has made her feelings quite clear and that of course interferes with due process and the panel has now been compromised. "We have indicated to the Policing Board that we want legal opinion taken on this matter." Asked if Ms McDonald had jeopardised the recruitment process, she replied "she has of course". Image caption Arlene Foster described Mary Lou McDonald's comments as "very foolish"
The Police Federation for Northern Ireland, which represents rank and file officers, said Sinn Féin must apologise. However, speaking to the media on Tuesday, Ms McDonald said she had nothing to apologise for. "I was asked could I identify someone from the senior team who I thought ought to be chief (constable) and the truth is I can't," she said. Earlier, Dr Michael Wardlow, from the Equality Commission, said the chief constable appointment needed to be free from political interference. The commission has written to the oversight body, the Policing Board, to say that it must recruit in a non-discriminatory way under equality legislation. "Fair employment and equal opportunities legislation are built upon open and transparent practices, free from political interference and based upon the merit principle," said Dr Wardlow. "This approach has been important in helping to create fair employment procedures on which all prospective applicants can rely. "The Policing Board will need to ensure that the principles of equality law are applied fully and rigorously in the forthcoming competition for a new chief constable and that all involved are aware of the critical importance of this." However on Tuesday's BBC Radio Ulster's Stephen Nolan programme, Sinn Féin's policing spokesman said officers in the PSNI were capable of the top job. "Any Sinn Féin member that sits on any of the selection panels will act on the basis of objectivity and on the basis of merit, whether those candidates are from within the PSNI or from outside the PSNI," said Gerry Kelly. "There are clearly people capable within the PSNI and outside it to apply for this job." Sinn Féin appears to be sending mixed messages when it comes to who should replace George Hamilton. Were the original comments by Sinn Féin's president simply a slip of the tongue? Was Mary Lou McDonald off message when she spoke about the recruitment process? The Dublin TD does have form when it comes to making statements and then having to clarify them. Her remarks about the PSNI and the chief constable could have major ramifications for the selection process. Will it deter senior officers in the PSNI from applying? If senior officers make an application and are then not selected would they have a case for legal recourse? Ms McDonald can dismiss criticism from her political rivals, but the position of the Equality Commission and the Police Federation will require attention. Both organisations think her comments were ill judged and raise questions about political involvement. They have concerns that her words could impact the selection process for the next chief constable. That process is managed by the Policing Board of which Sinn Féin are members. Their job to find a successor to Mr Hamilton may have just become a little harder. What was said and why? 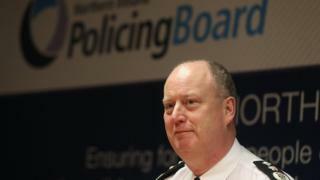 In January, Mr Hamilton announced he would retire later this year after five years as chief constable. "Is there somebody inside who I think should be the chief constable?" she said. "I have to answer honestly that no, I cannot identify such a person." The Department of Justice said on Monday that the Northern Ireland Policing Board was "putting in place a process for the appointment of a chief constable" and that it was "important to attract the best candidates from all quarters for this important and challenging role". Police Federation chairman Mark Lindsay said Ms McDonald's comments about Mr Hamilton's successor were "wholly inappropriate and offensive". "This amounts to extraordinary interference in an open and transparent selection process," he said. He added there was an "implication" that if anyone from the PSNI's senior team went for the top job that they may not be given "a fair hearing". "There's the implication that some might not even apply given that they feel they haven't got much of a chance," he said. What is the controversy over the legacy files? The PSNI was accused of a "cover up" after failing to reveal "significant information" about the gun attack at Sean Graham's bookies in south Belfast in 1992, which was carried out by the Ulster Freedom Fighters (UFF). Mr Hamilton faced a call to resign from the son of one of the victims. The Police Ombudsman has opened new inquiry lines after finding out about more material linked to the attack. It said that the problem had arisen due to issues including human error, "the sheer volume of the material involved and the limitations of the archaic IT systems".